Glaucoma is an eye disorder that, if left untreated, can eventually lead to blindness. It can be associated with an increase in eye pressure or intraocular pressure (IOP), which can cause damage to the optic nerve. In the more common form of glaucoma, which is ’open angle glaucoma’, damage can occur slowly, thus there is usually plenty of time to receive treatment to safeguard your vision. According to the World Health Organisation, next to cataracts, glaucoma is the second major cause of blindness. Angle closure glaucoma (ACG) is much less common in Ireland and typically affects older people with cataracts and sometimes younger long sighted individuals. ACG may present with repetitive sudden pain in the eyes and head, dilated pupils, loss of vision, red eyes, halos around lights, and nausea and vomiting. Vision loss progresses with each attack. Please attend an Ophthalmologist or Optometrist if you experience any of these symptoms. 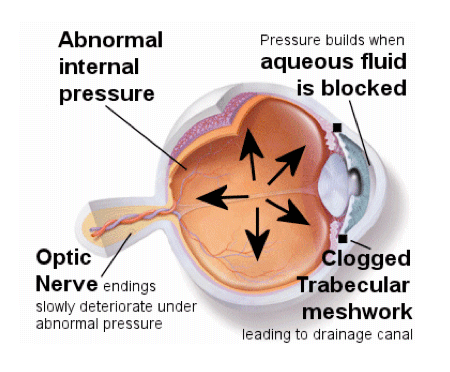 Primary Open Angle Glaucoma (POAG) is the more common type of glaucoma. This is a slowly progressing disease and usually the early stages are symptom-less. It often is undetected by the patient until a substantial vision loss has happened. Vision is at risk if the IOP remains high and untreated. By this stage permanent damage to the optic nerve may have occurred. This damage is irreversible so early detection is vital. The best way to prevent this damage is by early detection through having regular eye examinations. Glaucoma can be diagnosed when a person attends for an eye examination through a variety of routine tests. Early detection ensures that unnecessary damage can be prevented with proper treatment. Follow up examinations are important to determine if there is any further progression or damage. The Optic Nerve links the eye to the brain. Visual signals are transmitted through nerve fibres which leave the eyes at the optic nerve to travel to the brain. In Glaucoma, these nerve fibres are damaged. This damage can be detected by an Optometrist who is trained to see the subtle changes that may occur at the head of the optic nerve during a fundus examination. The eye’s Intra Ocular Pressure (IOP) should be below 21 mmHg. A high IOP reading indicates that the eyes are producing too much aqueous fluid or not draining properly and thus may damage the optic nerve. Central Corneal Thickness (CCT) is the measurement of the thickness of the front surface of the eye. A thinner cornea in conjunction with high IOP readings means the eye is under more pressure and therefore at increased risk of glaucoma. The corneal thickness is measured with a instrument called a Pachymeter. Visual Field Testing tells you if glaucoma has already damaged your optic nerve and by how much. It is done regularly to determine if there is progressive loss of vision from glaucoma by finding extension of blind spots due to optic nerve damage. You are asked to stare straight ahead at a target and click a button every time a light flashes in the field of vision. Most cases of glaucoma are controlled very adequately with eye drops alone that control IOP. Eye drops are occasionally combined with medication to control glaucoma for a limited period. Laser is used when eye drops on their own do not control glaucoma fully. Surgery is the last option and reserved for a small percentage of glaucoma sufferers who are not responding to eye drop medication. If an eye drop causes discomfort or other problems. Make sure you talk to your eye doctor rather than stopping the treatment. Often another eye drop that suits you better will be prescribed.